Mary Ellen Edmunds is a nurse, instructor, speaker, author, and self-proclaimed “happifier.” She is a member of The Church of Jesus Christ of Latter-day Saints. Edmunds was born in Los Angeles, California, on March 3, 1940. Her family moved to Cedar City, Utah, in 1943. Her father was a family doctor and her mother was a nurse. She is the second of eight children. The family moved to Mapleton, Utah, before her senior year. She attended Brigham Young High School and graduated in 1958. She was a writer in high school, contributing to the Y’ld Cat student newspaper, the Wildcat yearbook, the Fine Arts Magazine, the Literary Magazine, and the Poetry Contest. She was a member of Quill and Scroll. Edmunds served a mission to the Southern Far East Mission from 1962 to 1964. She spent four months in Taiwan, five months in Hong Kong, and fifteen months in the Philippines—she was one of the first two sister missionaries to serve there. She also served a health mission for The Church of Jesus Christ to the Philippines Manila Mission from 1972–1973, and a welfare mission to the Indonesia Djakarta Mission from 1976–1978. She earned a bachelor’s degree in nursing from Brigham Young University in 1962 and later became a faculty member in the nursing program at BYU (1965–1970). She worked as a nursing supervisor for Utah Valley Hospital for two years and coordinator of health missionaries for The Church of Jesus Christ for two years. She was director of Thrasher International Program for Children in Nigeria, West Africa, from 1984–1985. Edmunds served as director of training at the Missionary Training Center of The Church of Jesus Christ in Provo, Utah, from 1978–1995. 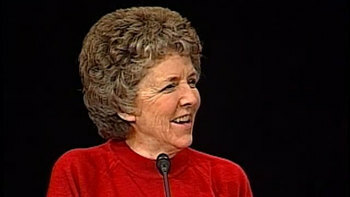 She served as a member of the Relief Society general board of The Church of Jesus Christ for eleven years (1986–1997). She is a popular speaker and author because of her humorous way of looking at life and not taking oneself too seriously. Her book titles include: Gratitude: The Theory of Relativity; Happiness: Finders, Keepers; Keeping It Together in a Pull Apart World; Love Is a Verb; MEE Thinks: Random Thoughts on Life’s Wrinkles; Peculiar in a Good Way; Thoughts for a Bad Hair Day; You Can Never Get Enough of What You Don’t Need: The Quest for Contentment; and Tug of War. She taught many classes at BYU Education Week, Know Your Religion series, Women’s conference, youth conferences, and Especially for Youth programs. She lectured on the 2014 Deseret Book Time Out for Women Series. This page was last edited on 1 February 2017, at 14:56.